The Great For You icon was developed to help our customers instantly identify food options that are better for them. It made its debut on Great Value and Marketside items in February 2012 and also appears on fresh and packaged fruits and vegetables at Walmart stores nationwide. 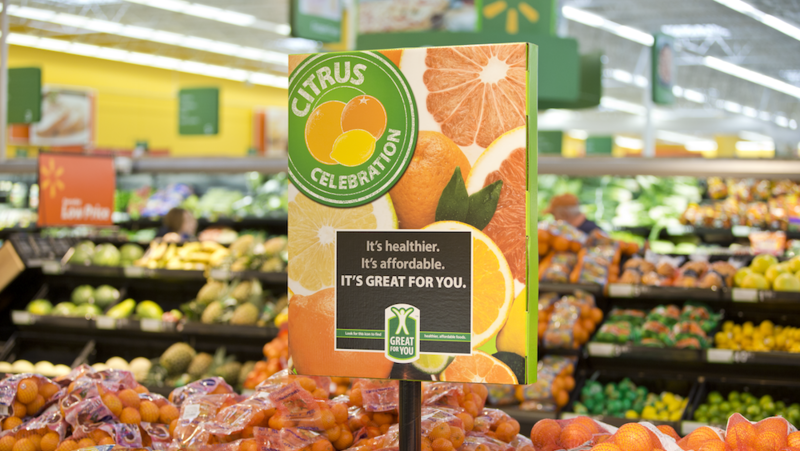 Today, more than 30 percent of qualifying items, including fresh produce, Great Value and Marketside private brands now carry the Great For You icon. Items with the Great For You icon must meet rigorous nutrition criteria informed by the latest nutrition science and authoritative guidance from the 2010 Dietary Guidelines for Americans, U.S. Food and Drug Administration (FDA), U.S. Department of Agriculture (USDA) and Institute of Medicine (IOM). Developed in consultation with food and nutrition experts from the public and private sectors, as well as leading health organizations, the icon represents a collaborative and transparent effort to develop a trusted and reliable system for consumers. Step one focuses on encouraging people to eat more fruits, vegetables, fiber-rich whole grains, low-fat dairy, nuts and seeds and lean meats. Examples include brown rice, 1% milk, raw almonds and 93% lean ground beef. Step two limits the amount of total trans and saturated fats, sodium and added sugars that can be found in items such as sweetened oatmeal, granola bars, flavored yogurt and frozen meals. References: 1. U.S. Food and Drug Administration. 21 CFR 101.65 2. U.S. Department of Agriculture and U.S. Department of Health and Human Services. Dietary Guidelines for Americans 2010. 3. U.S. Department of Agriculture. 9 CFR 317.362 4. U.S. Food and Drug Administration. 21 CFR 101.12(b) 5. U.S. Department of Agriculture. 9 CFR 317.313(l) & (m) 6. U.S. Food and Drug Administration. 21 CFR 101.13(l) & (m) 7. U.S. Food and Drug Administration. 21 CFR 101.62(e)(2),(3),(5) 8. Excludes eggs, nuts/seeds (spreads), oils, protein foods and dairy foods if covered in Steps 1 or 2 9. U.S. Food and Drug Administration. 21 CFR 101.13(h)(1). Per 50g if RACC is small. Small RACC = Reference Amounts Customarily Consumed of 30 g or less or 2 tablespoons or less. 10. Institute of Medicine. Dietary reference intakes for energy, carbohydrate, fiber, fat, fatty acids, cholesterol, protein, and amino acids. Washington, DC: National Academy Press, 2002. Exemptions: Food products excluded from program per FDA labeling exemption regulations: Food of no nutritional significance, 21 CFR 101.9(j)(4) (e.g., flavor extracts, food colors, dried spices). A product is exempt from nutrition labeling if it contains insignificant amounts of all of the nutrients required to be on the label. Food labeled for infants and children under 2 years of age, 21 CFR 101.9(j)(5).